The only murder mystery kit you'll ever need. You're dressed to kill. The starters are chilling. A pan bubbles ominously on the stove... Suddenly, the phone rings. "I'm sorry, I'm not going to be able to make it." You stifle a scream as the phone slips from your hand. Then you remember. You bought a Murder Mystery Flexi-Party! 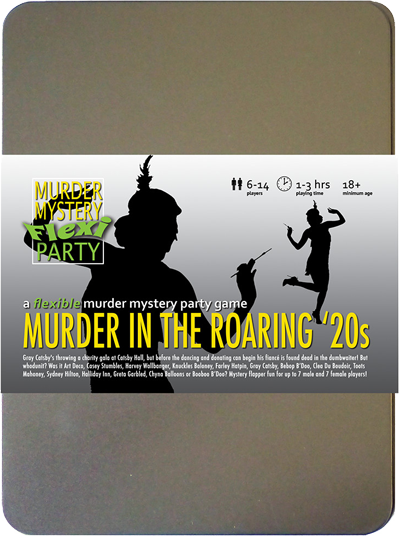 Flexi Party is the only murder mystery kit to work even if guests drop out at the last minute. You can invite any number of guests from 4 to 14 and you don't need an equal number of male and female characters. You can even join in yourself. Make your party more special with our audio downloads and VR scenes! *ZIP files must be extracted before playing. iOS devices cannot natively open ZIP files. Got a question, comment or suggestion? Get in touch. © D'Avekki Studios 2016. Murder Mystery Flexi Party® is a registered trademark.